But something changes in Ashaa’s demeanor when she starts talking about the educational support her family receives through Caritas Jordan with Catholic Relief Services and other partners. She comes to life. Jordan, a Mideastern country bordering Syria, is home to more than 600,000 refugees, more than half of whom are children. With the Syrian war well into its fifth year, government resources in neighboring countries like Jordan are stretched thin. That has resulted in long waiting lists for Syrian families trying to enroll their children in school. 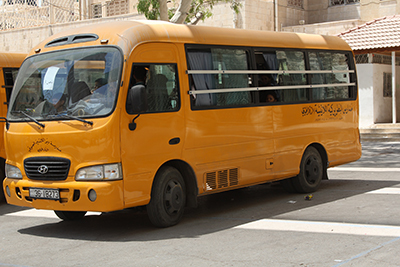 It’s estimated that fewer than half of the Syrian children in Jordan are receiving formal education. “Education is critical for Syrian refugee children who are increasingly facing child labor, underage marriage, and other child protection concerns,” says CRS Jordan program manager Michelle Ryan. To address this dire need, CRS, through our partner Caritas Jordan, provides Syrian children with four distinct educational opportunities: kindergarten classes, catch-up classes, remedial classes and child-friendly spaces. All four include psychosocial activities, counseling, and interventions to address refugee children’s emotional and mental health needs. Since the crisis began, the educational programming has grown exponentially, from a few partner schools with a few hundred students to nearly 6,000 students in 21 schools. Support comes from CRS donors, Caritas Austria, the U.S. State Department’s Bureau of Population, Refugees and Migration, and the Catholic Agency for Overseas Development. “With more resources, we have the potential to double this number in the coming years,” Ryan says. Ashaa’s 10-year-old daughter Waed, who is on a public school waiting list, takes catch-up classes intended for primary school-age children who have missed significant years of formal education. The classes help students with basic education to pass government-recognized exams and, prepare them for formal schooling should the opportunity arise. Given the duration of the conflict, many children have been out of school for years. Others have missed out on formal schooling entirely. It’s not just Ashaa’s children who are benefiting from the educational programming. Daylong workshops for parents help them with issues like handling bullying, and supporting children at home and school. “I’ve learned that I should insist that all of my children go to school so that when they grow up, they can help themselves have a better future,” Ashaa says. 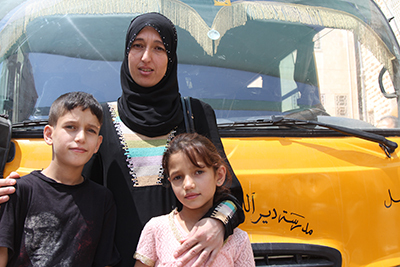 Ashaa and her family face an uncertain future. But Ryan warns that there is great danger in leaving such families behind.